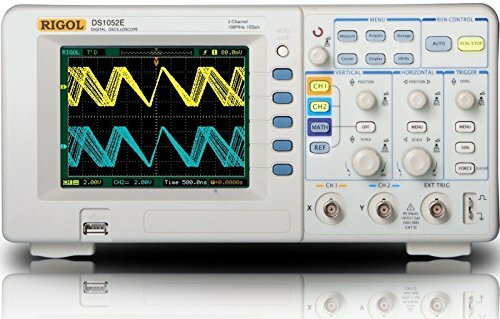 Rigol oscilloscopes are well-known for producing quality, yet inexpensive, oscilloscopes for hobbyists and electrical engineers on a budget. Rigol Technologies Inc. was founded in 1998 and they produce technology products primarily focusing on electronic measurement and chemical analysis. They are headquartered in Beijing, China and their primary mission is to produce low-cost, quality research and technology products for engineers, educators and researchers to help them solve measurement challenges in an affordable way. Indeed, oscilloscopes are essential devices for any professional engineer. They enable electrical engineers to detect electric signals that are varying over time. This is essential for troubleshooting circuits, detecting information related to amplitude, noise, frequency or any other type of characteristic that could be changing over time. It is an AC powered option that also ships with the PC software UltraScope and 2 probes- 1x or 10x selectable, and includes 2 probe hook tips. Users provide highly favorable feedback- saying that it is a great value purchase, with a solid plastic build-quality, functional buttons, and a cost of about a 10th of what a professional-quality oscilloscope would. Some say the software is junk, while others say that with some ingenuity, a fresh download of Windows drivers, and a read-through of the Rigol FAQ, that it became a useful if somewhat remedial software resource. On the downside, the fan is a little bit noisy. And some users say that if you are looking for highly subtle measurement capacities, that it would be better to purchase professional engineering equipment. 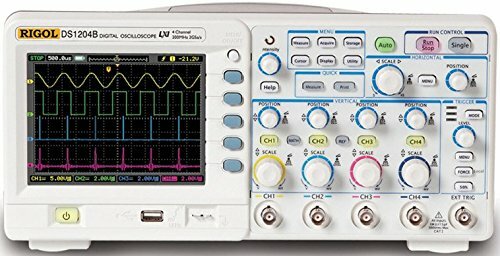 But these Rigol oscilloscopes are great value for experimenting hobbyists or electrical engineering students. The 4 channel, 50MHz Rigol DS1054Z Digital Oscilloscope is an excellent option that uses an innovative Ultravision technology, and provides deeper memory of 12 Mpts. Its users love its solid build, but also note that the fan is relatively loud. It has sample rates of up to 1 GSa/s and capture rate has higher waveform of up to 30,000 wfms/s. Record and replay of waveform can be done in real time (up to 60,000 frames optimum). This 4-channel digital oscilloscope is a great option if you are looking for an entry-level oscilloscope that is also loaded with tons of features. This digital oscilloscope is a highly rated product that users are generally very satisfied with. They like that it has ethernet, USB, 4 channels, and relatively good bandwidth for the needs of most hobbyists and even students and professionals. Other features that users thought were really cool include multiple triggers, great storage, and intensity graded display that mimics what an analog scope can do. On the negative side, this oscilloscope has a fan that some may find rather noisy, and a screen that could be a bit bigger, although these were not deal breakers for most users. The dual channel, 100 MHz l Rigol DS1102E Digital Oscilloscope is a sensible option that has one external trigger channel. Its users love that it is very affordable, but also note that the color screen is somewhat grainy. It provides 20 types of wave parameters for automatically measuring, which contains 10 Voltage and 10 Time parameters. Its built-in help menu enables information getting more convenient, and it has a unique waveform record and replay function. 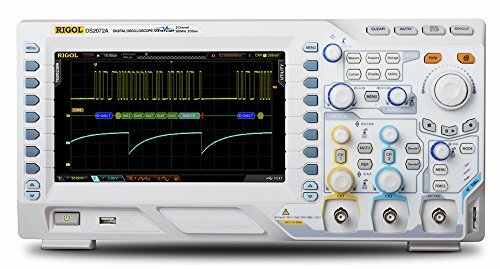 This entry-level oscilloscope is a safe choice if you are looking for an economical digital oscilloscope with high performance. Users of this oscilloscope unit agree that it is solidly built and that the operation of the various features is quite easy. People who are on tight budgets find that this scope fits the bill for general purpose testing. They find the menu options easy to understand and they also like the graphical interface. Although the resolution is a bit lower than other entry-level products, users find that this is practically not a concern at all. A few users noted the fan noise, but others don’t notice it at all. The probes that came with the unit worked well enough for most users, although some think they are not of the best quality. A number of users also complained that the frequency readout is not good. The ultra compact Rigol DS1052E 50MHz Digital Oscope is a good option that has alternate trigger mode and adjustable trigger sensitivity. Its users love that it is light and portable, but also note that the screen resolution looks pixelated. It features 1 Mpts memory depth, record and replay, and roll mode. It has a 1 GSa/s maximum real-time sample rate and 5GSa/s equivalent time sample rate. It comes in multiple interface configurations: Standard USB Host and USB device, RS-232 and support U disk storage and PictBridge print standards. This portable oscilloscope is a solid option if you are looking for a budget-friendly digital 2-channel oscilloscope. The general consensus on this Rigol oscilloscope is that it is a very capable equipment for its price point. One of the features that users liked most is its portability. Its storage and math computation capabilities were also good for a lot of users. They also like the straightforward control operation and clear and intuitive on-screen menus. The negative comments on this product are mostly on its low resolution screen and noisy fan. One user also complained that the power cord is very loose and you lose power when you move the scope. The dual channel, 70 MHz Rigol DS2072A Digital Oscilloscope is a superb option with 2 GSa/s and 14 Mpts memory standard. Its users love its rock solid build and really have nothing bad to say about it. It has dual impedance inputs (50 Ohm and 1 MOhm) and wide vertical range (500uV/div ~ 10V/div), lower noise floor, better for small signal capturing. Its innovative UltraVision technology provides up to 256 levels intensity grading waveform display. It has a high waveform capture rate of up to 50,000 wfms/s, realtime waveform record, replay, and analysis (up to 65,000 frames). This high-quality product is one of the best options if you are looking for a very well-designed digital oscilloscope. Most users of this Rigol oscilloscope highly recommend this product model, and think that it is better than other comparable brands. They love its good build quality, and find the probes that came with the unit quite decent. One user particularly liked that the analog front end has been verified to handle much higher bandwidth than the firmware allows. Users are delighted with its hoard of features, especially the interface that is very intuitive and well thought out. The 4 channel, 200 MHz Rigol DS1204B 200 MHz Digital Oscilloscope is a solid option that has 1 external trigger channel, which can capture multi-channel signal simultaneously and meet industrial needs. Its users love that it offers 4 Channel measurement capability with adjustable trigger sensitivity for effective noise removal and false trigger elimination, but also note that it is more expensive than other Rigol models. It has USB storage, USB and LXI connectivity, and 2 GSa/sec sampling. It has 16 kpts (half channel) and 8 kpts (each channel) Memory Depth. It also provides users with backlit keys, intuitive user interface and built-in menu help. This high standard equipment is a great option if you are looking for an industrial level digital oscilloscope. People who purchased this model are generally happy with its great performance. They love its graded display and powerful trigger and analyzer abilities. In addition, users enjoy viewing the multi-channel signals simultaneously via the 4 analog channels, which can be operated independently. It is fully loaded with features, which users in different sectors (manufacturing, education, research, etc.) also greatly appreciate. Users also like the clear LCD displays and math operations which enable them to view and analyze signals faster and more clearly. The essential duty of an oscilloscope is to plot on a graph electrical signals as they vary over time. In general, these o-scopes will generate this information on a 2-dimensional graph where time is plotted on the X axis and voltages plotted on the Y axis. 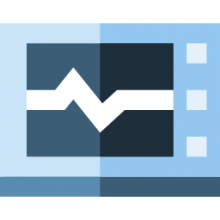 The oscilloscope will include controls around the screen that will enable you to adjust the adjust the graph scale horizontally and vertically, enabling you to focus in on the signal. Some users prioritize portability in their o-scopes and others prefer traditional o-scopes. Besides these essential functionalities, many of these oscilloscopes also have additional measurement tools that let you easily measure a variety of other waveform characteristics. Oscilloscopes are able to assess time characteristics as well as voltage characteristics. Within timing characteristics, they can assess frequency and period, duty cycles, rise and fall times. Within voltage characteristics, they can assess amplitude, maximum and minimum voltages, as well as mean and average voltages. There are a variety of oscilloscope terms that you should become familiar with prior to using your Rigol scope. Make sure to investigate your oscilloscopes bandwidth, which describes how fast they're able to see signal changes. The channel amount refers to how many signals it can lead to a single time. Vertical sensitivity refers to the minimum and maximum oscilloscope values on the vertical voltage scale. There's also a bit of a confusion sometimes regarding the differences between digital and analog also scopes- electronic scopes can either be digital or analog. Analog scopes will employ an electron beam to assess input voltage. Digital o-scopes, on the other hand, will use microcontrollers to assess the input signal employing an analog-to-digital converter to generate this display. In essence, analog o-scopes are generally older, feature lower bandwidths, and include fewer features, but they typically have faster response times. The specifics of scoping signals can get pretty complex and is beyond the purview of this particular post, but there are a variety of useful resources on the Internet, including YouTube videos, to go into the nitty-gritty of oscilloscope functionality should you need a primer. 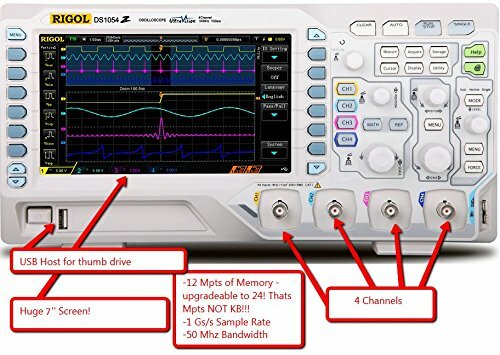 We've included some helpful links below, and sprinkled within this post, but suffice it to say that a Rigol oscilloscope is a quality device ideal for amateur and intermediate professionals on a budget.